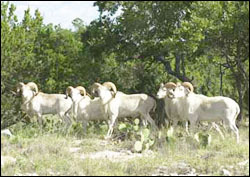 The Texas Dall, also known as the White Corsican, is a cross between a European Mouflon & a domestic Barbados sheep. It is solid white, with horns that circle and turn outward at tips. Horns are anywhere from 14 inches long to 35 inches. Males weigh up to 150 pounds, and the females weigh between 80 - 100 pounds. Texas Dall Sheep are gregarious in nature, and the males are very agressive toward one another. They breed between August and September and their gestation period is 5 months long.